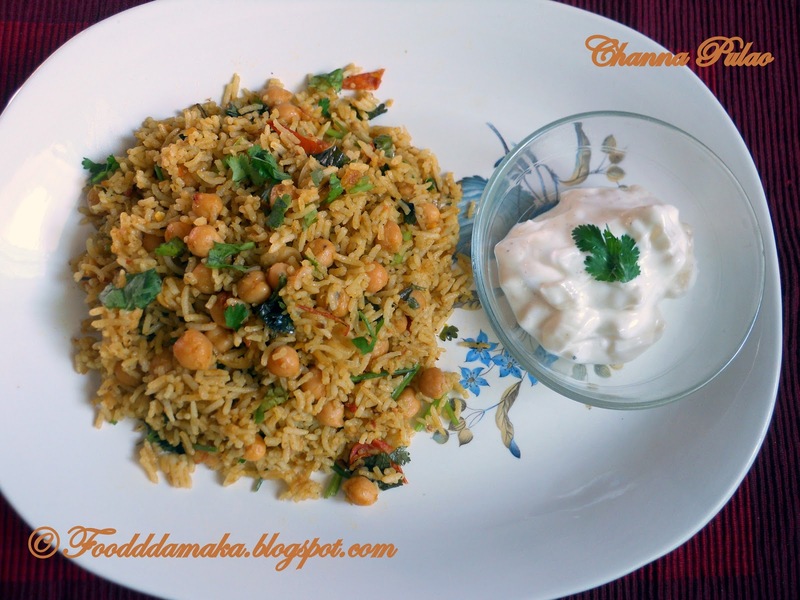 I made this channa pulao for my saturday lunch.First time i made this pulao and it came deliciously.We had it with onion raitha otherwise you can have with any kurma.Here goes the recipe..
Wash and soak the rice for 30mintutes.After 30minutes drain the rice and keep aside. Heat a kadai with 1tsp of ghee,add shahi jeer ,bay leaves and cardamon.Add the rice and saute for few minutes so that rice is nicely coated with ghee.Add 3cups of water and little bit salt and cook on high flame for 5minutes and when you see water bubbling,simmer the flame and close with lid.Cook till water is completely absorbed.Once it is done.Spread the rice in a large plate. Heat a pan with oil,add chopped onions and fry them till they turn into pale colour.Then goes the grounded masala paste and saute till raw smell goes out.Then add chopped tomatoes along with turmeric,chilli powder and required salt.Mix them well and fry till tomatoes are nicely cooked.Add the cooked channa/chickpeas and mix well so that it is nicely coated with the masala.Once oil oozes out,add the cooked rice slowly and mix well and cook with closed lid for 2minutes.Before removing from the hob add remaining chopped coriander leaves and transfer into a serving bowl and enjoy with onion raitha or with your favourite kurma. Delicious one pot meal. I love it. Very nutritious n healthy pulao..yum yum!! Super tasty and inviting pulao !! I make this regularly for my lunch boxes !! Photos are very inviting..I am sure channa puloa tasted great. U just make me feel hungry- delicious one! That's a bowl of Flavorful rice. Looks so healthy and filling. Yum!!! pulao looks so inviting..very tempting clicks..glad to follow u..do visit my space too in your free time.